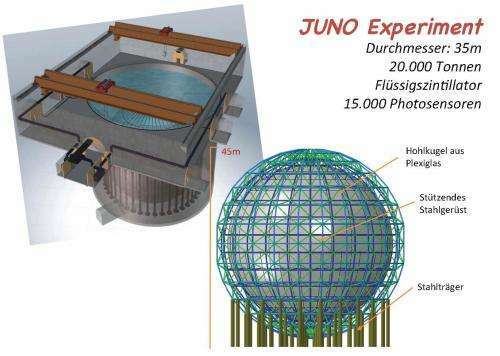 The construction of the facilities for the JUNO neutrino experiment has been initiated with an official groundbreaking ceremony near the south Chinese city of Jiangmen. Involved in the Jiangmen Underground Neutrino Observatory (JUNO) will be more than fifty institutions from China, the US and Europe - with six from Germany alone. Starting in 2020, JUNO will begin to produce new information about the particle characteristics of the neutrino. "The aim of JUNO is to precisely measure the oscillations of neutrinos for the purpose of investigating one of the major issues in neutrino physics today - the sequence or hierarchy of neutrino masses," explains Prof. Michael Wurm of the Institute of Physics at Johannes Gutenberg University Mainz (JGU). He is acting as one of the German JUNO partners and was at the site to watch the start of work on the underground lab. I have a different theory about neutrinos, and have written a paper about it.